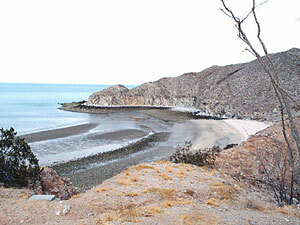 Crystal Beach, San Felipe, Baja, Mexico. Crystal Beach is a bit of an enigma. I don't know the local name for the beach and except for fishermen, kayakers and the intrepid off-roader, it's not easily accessible. Residents who have lived here for many years call it the "nudist beach", presumably because it's difficult to find and one doesn't expect a tour guide with a large group of sightseers to tread across your beach blanket while sunbathing those hard-to-expose-without-getting-arrested places. The interesting thing about Crystal Beach isn't on the beach itself. About a hundred yards to the north, just past the sandy border, you'll find a set of stairs, interrupted by some sort of miniature rock amphitheater. 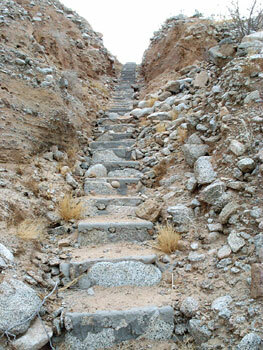 The stairs climb the bluff to a promontory that overlooks the beach and the Sea of Cortez. It's a magnificent view. More work is evident on top of the bluff, not too far from the edge. 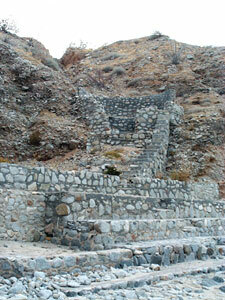 There you'll find a small house foundation of cement with inlayed stones. Nearby is a sunken hole with the remains of what might have been an outhouse. There's a distinct hippy-ish flavor to the abandoned project, now in ruins. Perhaps it was wiped away by weather or intruders. It must have been a splendid residence at one time, full of sun, smooth beach-tumbled stones, and the spangle of a brilliant Milky Way in the evenings. One wonders how the logistics of water and staples were handled. 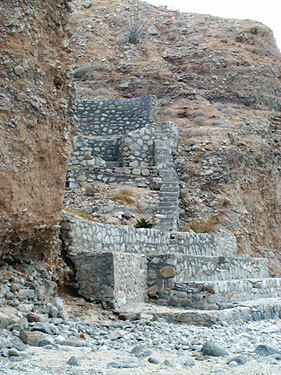 A short run of long cement and stone steps at beach level might have been a sort of wharf where boats once put in with supplies. Certainly the overland route would have been intimidating. I'm not aware of any species of cliff-dwelling burros. In any event, the original progenitors of the one-time residence are long gone. No one seems to know who they were. For many in the area, the stone architecture mounting to the bluff is just another Greek ruin --with an occasional view of a nudist sprawled below on the beach.